I was just looking down at the person whom you quoted that accused you of misusing Planck's Law. What I find as strange is that these same people seem to think that the Stefan-Boltzman law means anything other than the emission temperature of the surface of the Earth. While Planck's law describes what the Sun's emissions are actually doing to the Earth. The "emission" factor of the Stefan-Boltzmann law isn't even important since we know that the energy in-energy out ratio is very very close to 1. This makes the emission factor also so close to 1 as makes no difference. There certainly seems to be a great many people who do not actually know anything but instead are arguing that someone ELSE does. Now I find that pretty silly. 1. Different photons have different amounts of energy. Planck's law tells you how much energy each photon has by factoring the photon's wavelength and the temperature of the body emitting the photon. At the same time, the reverse is used to determine if the energy level of a particular photon of a particular wavelength is sufficient to be absorbed by a particular body of a particular temperature. This ensures Planck's law adheres to the 2nd LoT. 2. Stefan-Boltzmann is derived from Planck's law by simply integrating it over all wavelengths ... which is why it is absolutely absurd for anyone to even pretend to discuss specific wavelengths or frequency bands when discussing Stefan-Boltzmann because it covers them all. Stefan-Boltzmann tells you the total radiance power, i.e. energy over time, for a given temperature. 3. The "emission factor" you reference is "emissivity." It is representative of the effectiveness of the body's absorptivity and radiativity of electromagnetic power, all wavelengths combined. Emissivity is the term used with Stefan-Boltzmann and is NOT the same thing as "emissivity" when used with "absorptivity" although it works in the same manner. Emissivity, when used with absorptivity, applies to specific materials wrt specific wavelengths. For example, you can talk about the absorptivity of wood (say, oak) for frequencies of 800GHz. Kirchoff's law simply states that the emissivity of the oak wood at 800GHz will equal the oak wood's absorptivity at 800GHz. Emissivity in the context of Stefan-Boltzmann does not involve materials or wavelengths. It pertains to a "body" which of course will be of some specific material but the specific material is not a factor in the calculation, only the emissivity (which is also its "absorptivity") because Stefan-Boltzmann applies to all matter, always, everywhere and includes all wavelengths. Oh, and as a side note, no one knows the earth's emissivity. We don't know if it is "close to 1.0" or if it is around "0.3" or what it is. No one knows. Sure, Wikipedia claims to know that 0.64 is the value of earth's emissivity, so the good news is that you at least know one value that the earth's emissivity is not. Wake wrote: There certainly seems to be a great many people who do not actually know anything but instead are arguing that someone ELSE does. Now I find that pretty silly. Wake, the short answer is "Of course it's that way!" Global Warming and Climate Change are religions and what you are noting is the "I don't know the answer but I will refer you to my preacher; he explains it so much better than I do" effect. 1. The wavelength of a photon IS its energy level. 2. Uh, yes, but the Earth is in temperature balance so power in = power out. 3. Since power in = power out the emissions of the Earth (or emissivity in the calculation) have to be 1 at the Earth's temperature which is in balance. There is some very slight difference since some of the Sun's power applied to the Earth is absorbed by the plant growth but it is remarkably small and far less than 1%. Wake wrote: 1. The wavelength of a photon IS its energy level. No. A photon's wavelength is its wavelength. It's energy level is a function of the photon's wavelength and of the temperature of the matter that emitted the photon in the first place. The laws of thermodynamics mandate that we always take temperature into account. 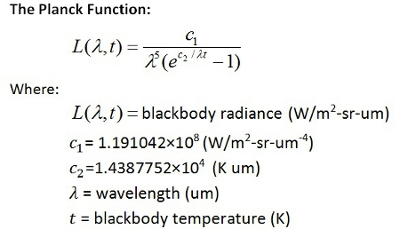 In this equation, "L" = the photon's energy LEVEL and it is a function of both wavelength and of black body temperature. Wake wrote: 2. Uh, yes, but the Earth is in temperature balance so power in = power out. Wake wrote: 3. Since power in = power out the emissions of the Earth (or emissivity in the calculation) have to be 1 at the Earth's temperature which is in balance. No. The emissivity constant specifies what percentage of thermal radiation is absorbed (efficiency of absorption) and what percentage is emitted (efficiency of emission). By Kirchoff's law, the efficiency of absorption will equal the efficiency of emission, hence only one emissivity value for both. Also, per the laws of thermodynamics, the amount absorbed will be the amount emitted. What you are talking about is the amplitude of a wave. If you look at a Red Giant star you tell its temperature not by the amplitude of the wave but the frequency of the emissions. I don't understand what you think you're talking about. Are you attempting to say that "thermal equilibrium" is a better description than "power in = power out" to the layman? Again let me ask you using your own terms - IF you add energy to a system and it emits all of that energy what the hell are you talking about "absorbed"? Wake wrote: What you are talking about is the amplitude of a wave. Nope. What I am talking about is a quantity of energy. That's all. One more time: a quantity of energy. Every photon is a quantity of energy, specifically a quantity of electromagnetic energy. If a photon of wavelength lambda is emitted from a black body of temperature T, then it will be a photon of energy quantity L as determined by Planck's law. If you integrate Planck's law over all wavelengths you end up deriving the Stefan-Boltzmann law which tells you the power that a black body of temperature T radiates per a given area, and that sums the power of all wavelengths. Wake wrote: If you look at a Red Giant star you tell its temperature not by the amplitude of the wave but the frequency of the emissions. I don't understand what you think you're talking about. It was you who introduced amplitude, and switched from wavelength to frequency. Wake wrote: Are you attempting to say that "thermal equilibrium" is a better description than "power in = power out" to the layman? I was agreeing with you. The correct term for what you were describing is thermal equilibrium and is the treatise of the zeroth Law of Thermodynamics. Wake wrote: Again let me ask you using your own terms - IF you add energy to a system and it emits all of that energy what the hell are you talking about "absorbed"? Your wording makes no sense, but I will take a stab at parsing it. In classical physics, a black body is defined as a body that emits all the energy that it absorbs. This definition ensures black body science adheres to the laws of Thermodynamics. Black bodies are matter. Any matter, any shape, any form, any size, any mass, any nationality, creed or sexual orientation. Planck's law, Stefan-Boltzmann, Kirchoff's law, etc... pertain to all matter, always, everywhere. No one knows the emissivity of earth. The sun's power at earth is estimated to be around 1,368 Watts per square meter or 1,368,000,000 Watts / km^2 and we know that there are 255,670,700 km^2 for a grand total of ... 3.5 x 10^17 Watts of power incident with earth. So here is the point. We don't know what earth's emissivity is, despite Wikipedia's claim to the contrary, but let's pick a value for the sake of discussion, say 0.7 then we would multiply that emissivity to the incident energy to realize the amount of power that the earth actually absorbs, i.e. 0.7 x [3.5 * 10^17 Watts] = 2.45 * 10^17 Watts absorbed by the earth. ... and guess what, that's the earth's radiance as well, regardless of how much CO2 is in the atmosphere, ... or methane, or water vapor, or whatever. What you are talking about is the amplitude of a wave. No, He's talking about energy conversion, Wake. If you look at a Red Giant star you tell its temperature not by the amplitude of the wave but the frequency of the emissions. No, you can't tell the temperature of any start to anything close than a few thousand degrees that way. I don't understand what you think you're talking about. He actually does, Wake. It is YOU that is denying these laws. It's called thermal equilibrium. Thermal energy isn't the only kind of energy, Wake. Energy can be converted from one form to another, Wake. Conversion of electromagnetic energy into thermal energy is often one consequence of absorption.